human rights | Ban Tear Gas Now! 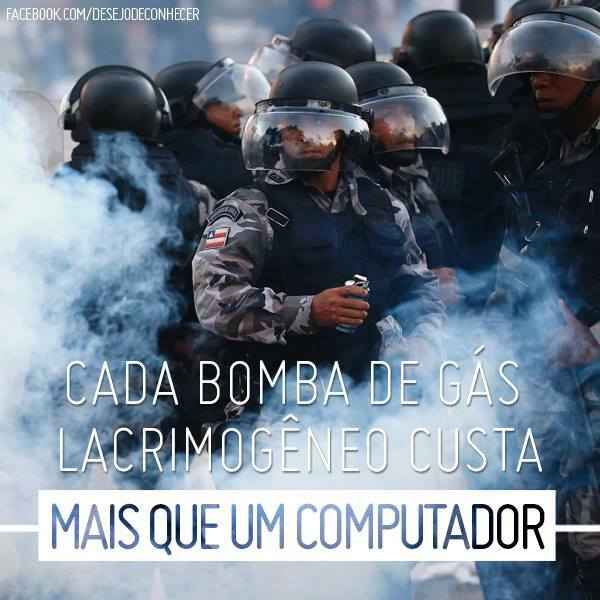 This link comes from Ricardo Silva, who states: “Each tear gas bomb cost for Brazilian police around US $400.00. More than some desktop computers.” Ricardo has been kind enough to share many resources related to tear gas abuse in Brazil on our Facebook Page: please show your support for our cause by liking this page on Facebook and sharing additional resources there. Unfortunately, there has been a lot of news relevant to tear gas and its harmful effects lately, and I have been slow in updating readers. I will do my best to update this page as quickly as possible. As always, stay safe, and keep protesting this dangerous weapon. Our hearts are with those who have been affected by the very real consequences of tear gas and government abuse. Thank you for your support and desire to create a more peaceful and just world. Tear gas is being continuously used in Instanbul, so much so that other parts of the city are being impacted. The most telling detail of the tragedy unfolding comes from the same article: that protesters are now writing their blood type on their forearms. There are no words. This is not right. Citizens should be allowed to speak out without harm or fear. America: stop the sales of this dangerous weapon! US companies should not be permitted to profit from this reckless abuse of authority. More and more often, tear gas is only used to suppress democracy and protect those illegitimately in power. Stop poisoning innocent civilians! Obama has pointed to using chemical weapons as the red line that Syria should not cross, but what is the difference between foreign countries using specific types of chemical weapons versus others, or foreign countries and our own homeland using chemical weapons on its citizens? It’s a big red line that the US has already crossed, but it’s not too late to step back. Let’s lead by example. Ban ALL chemical weapons, especially the ones we produce on American soil. For a Safe May Day! May Day has a long revolutionary tradition. As protests and demonstrations take place today, I hope that both protesters and police will act peacefully. If tear gas is deployed and you are exposed, please remember that this is not a joke. It is not harmless, and others around you may be impacted by it more than you. Even if you don’t immediately feel the effects, seek medical assistance quickly. Rinse your eyes and discard clothing that has been exposed as soon as possible. In some cases, water can actually reactivate the tear gas, which is why it is important to seek medical attention. If you are pregnant, remain calm, but immediately leave the area. Tell others so that they can assist you. Get to the nearest emergency room and explain what has happened. Demand an ultrasound and a plan for follow-up care. Do not let a doctor brush off your exposure due to a lack of experience on their part. US Poison Control may state that at as long as you were in an open area, you probably are ok: this is not necessarily true. Assist others in seeking medical help if you are in an area where tear gas is deployed. Pregnant women, children, elderly, and those with immune deficiency disorders or disabilities are especially prone to tear gas’ effects. If you are a police officer, please remember that innocent people may be harmed irreparably if you choose to use tear gas. Please share widely. If you would like to translate this into a foreign language so that this message can be more widely spread, email banteargas [at] hotmail [dot] com . This news comes from the Huffington Post. Which is worse, some noisy party goers and bottles being thrown, or a potentially toxic gas being released in a crowd? I’ll refrain from writing excessively about this, but feel free to share your opinions in the comment section, especially if you were witness to the scene. One more example of why we should stop trusting military suppliers to tell us what’s safe. With even MORE direct evidence of soldiers being harmed (since foreign civilians seem to go unnoticed), will the public finally step up and demand accountability from our leaders? What will it take to get the public off their butts and on the phones with their representatives? Or better yet, when will more citizens start actively protesting government offices for an end to irresponsible military spending? This photo shows an Iraqi soldier with an ADE 651. If there is a bomb in that car, then that device won’t detect it. After Tony Blair spending British taxpayers’ money on searching paranormally for non-existent “weapons of mass destruction” in Iraq … after non-scientific conmen landing top “scientific” bureaucratic jobs in the government of Israel and of New Zealand … now this. The British businessman’s fraud likely killed many soldiers who relied on the bogus devices to detect explosives. Today I wish to address the larger issue of social inequality. Until the government provides protection for citizens without money from those with money, the barrier to the elimination of chemical weapons and justice for those victimized by chemical weapons will remain. There are many politicians and corporate executives that make a living by ensuring others’ deaths, destruction of property and livelihoods, and submission, which is arguably death in itself. Ironically, these are often the same politicians who like to draw support based on their “family values”. I question the values of anyone who wastes taxpayers’ money on challenging women’s right to reproductive care only then to turn around and fund weapons which kill and maim innocent families across the globe. The US legal system is theoretically meant to establish rule of law in order to assure citizens’ rights are protected. Every day, however, I become more and more disillusioned about how this protection of the citizen without access to large sums of money can actually occur. We in many ways have not progressed past the original philosophy of rights as belonging to the property owners; rights are not shared equally. The property owners still include the poorer citizens amongst their chattel, and those running the government allow this exploitation to continue as they, too, benefit from this arrangement. Until there is equal access to the courts for victims and their families, regardless of income level or nationality, the fight for justice will remain a pipe dream for many around the world. In reality, those who have been affected by chemical weapons are not in a position to challenge their exposure in court. We need to recognize that if we allow victims who can’t fight for themselves to continue to be victimized by weapons our tax dollars pay for, we are complicit in their suffering. If we allow our government to continue to conceal evidence of its wrongdoing against innocent citizens, we are complicit. If corporations operating within our borders help other governments victimize their citizens, then we are complicit. Step up and help right the wrongs of our government and American corporations. Seek accountability from the corporations who profit off of the production of chemical weapons. Contact your local politicians and tell them why you want to see reform of our current laws which allow the production and use of chemical weapons in any context. Share information regarding the dangers of chemical weapons with your loved ones and get them involved in the fight for justice for all. This is the start of my day. Every day, two years and counting. How do I get closure? Am I closer or farther? Why am I fighting Goliath when most days I don’t even know what I did with my slingshot? There are a series of smaller fights that must take place every day, but I can’t stop until the bigger fight is won. Every day my thoughts are focused on how do I make others understand the importance of my mission to ban the production, distribution, and use of tear gas, and then from there, how do I use that shared understanding to effect change. Right now, I am gathering rocks. Like this one. Or this one. Every day I put more information in my arsenal. While I’m gathering ammunition I may be missing sight of other opportunities to win the war, but this is all I can do until I find that damn slingshot. Please join my cause. Help stand up for those who can’t. Write your local authorities about the ethics of using chemical weapons on citizens. Challenge politicians, bureaucrats, producers and distributors of “less lethal” technologies who profit from killing and denying citizens their basic rights. You can contact Combined Tactical Systems at 724-932-2177. Leave a voicemail for CEO Don Smith, who is conveniently out for the day. Share this mission with others who are willing to fight. You can also show support by liking the Ban Tear Gas Now! Facebook page and following us on Twitter @BanTearGasNow. During my senior year in college, many years ago, my professor accused me of always trying to reinvent the wheel. It was in my nature to be as independent as possible, and being in an arts focused program at the time, I felt the need to make sure I didn’t steal inspiration from other artists. It was more about a code of ethics than stubbornness. Although I can be found guilty of this quality, too. You need to be stubborn if you are going to accomplish your goals. So I let the criticism slide off my back. But now, as I push forward in my research, I have realized that collaboration is a necessary aspect of what I am trying to accomplish. First of all, in order to avoid repeating history, learning from others is just common sense. That’s why one purpose of my site has been to promote the work of others who have also written about this subject from a knowledgeable standpoint (and not the one promoted by the corporations who profit from weapons sales). Secondly, the efforts of many will (most often) trump the efforts of one: if it’s just lonely little me on a soapbox, there’s only so far this message can go. If you know of or work for an organization that would be willing to sponsor my efforts this summer as I conduct interviews and create activist toolkits/ materials, please contact me at banteargasnow (at) hotmail (dot) com. Thank you for your support of this cause, and for the efforts you take each and every day to make this a better world. And another older work by an author from 2006, Jacob Katriel, who tried to get answers about tear gas from a military representative of the Israeli Governmental Radio. Read what he wrote here.